Corporate Family Responsibility (CFR) is companies’ responsibility towards their employees. Work–Life Balance (WLB) and employees’ wellness policies are the main tools for CFR implementation in both large companies and Small and Medium Sized Enterprises (SMEs). This work investigates the application of CFR in the context of Italian SMEs. The chapter adopts the case study methodology and analyses a sample of five companies that have successfully implemented good CFR practices within their business strategy. Data were gathered through semi-structured interviews with companies’ CEOs. Results emphasize a growing attention by Italian SMEs towards the topics of CFR and WLB policies. Interviewees agree that implementing these tools allows the increase of both personal and professional serenity levels and reduces stress factors with positive impacts on performance. 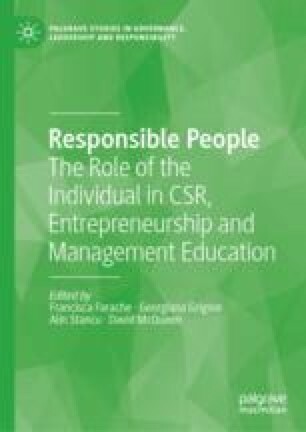 This work was conducted within the framework of the pilot research project “Good practices of Corporate Family Responsibility and Work-Life Balance”, carried out by the Marco Vigorelli Foundation (FMV) in Milan (Italy). Details of FMV projects and activities are available at: http://www.marcovigorelli.org/good-practices-conciliazione-lavoro-famiglia-welfare-aziendale/. The author would like to thank the members of the Scientific Committee within FMV for their feedback, as well as the coordinating and research team for the support provided during the making of this first step of the project. Boushey, Heather, and Sara J. Glynn. 2012. There Are Significant Business Costs to Replacing Employees. http://cdn.americanprogress.org/wp-content/uploads/2012/11/CostofTurnover.pdf. European Commission. 2011. A Renewed EU Strategy 2011–14 for Corporate Social Responsibility. http://eur-lex.europa.eu/legal-content/EN/TXT/?uri=CELEX:52011DC0681. Macchioni, Elena. 2012. Welfare aziendale. Buone pratiche di conciliazione famiglia lavoro. http://www.politichefamiglia.it/media/81502/elenamacchioni.pdf. Pedrini, M., and Carlotta Petri. 2009. Politiche e misure di conciliazione nelle aziende socialmente responsabili. In Famiglia e Lavoro in Lombardia. L’esperienza del Progetto e Premio FamigliaLavoro, ed. Sara Annoni. Milano: Altis. http://altis.unicatt.it/altis-2009_quaderno.pdf.